The aircraft involved in this accident was a requisitioned Imperial Airways Empire Flying Boat, its pre-war civil registration being G-AETY. While in service with Imperial Airways it had carried the name Clio and from the few mentions of it in the No.119 Sqn Operations Record Book this appeared to have been retained. No.119 was stationed at Bowmore, only about 3 miles from where the crash occurred, the aircraft was taking off from Loch Indaal when one of its starboard engines failed. The pilot is reported to have attempted to feather the propellor of the failed engine but it was stuck in fine pitch. This caused a significant amount of drag and the aircraft began to bank to starboard. 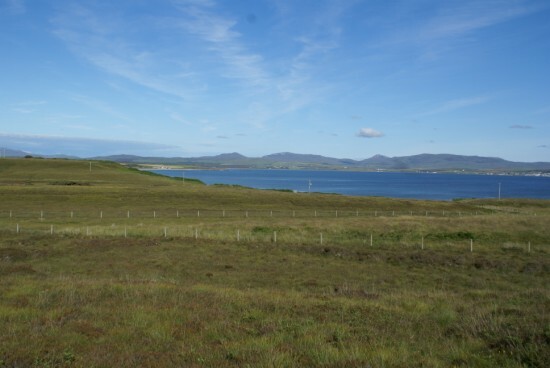 The pilot then attempted to force land the aircraft on an area of boggy ground just inland from Traigh an Luig but the aircraft was wrecked severely injuring the pilot. The squadron record book makes no mention of any other crew or passengers but a note scribbled on the back of a photograph taken at the time suggests that there were a number of people onboard. All that can be assumed is there were no fatalities. Nothing remains at the site today due to the widespread peat cutting that has taken place in the area. This photograph replicates the photograph taken at the time of the crash, the small notches in the ridge line and the horizontal line created by the far shore of Loch Indaal were the key features.